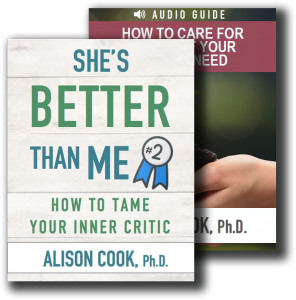 Cultivating Healthy Distance - Alison Cook, Ph.D.
“Healthy distance” is a phrase that has been on my mind a lot lately as I help people grapple with difficult relationships. My mom always used to say, “some people are loved best from a distance.” I never really understood this saying until I began to think about the parts of ourselves that carry conflicting feelings toward others, especially those individuals who have hurt us, rejected us, or even abused us. One part of us may desire to show Christ’s love and forgiveness toward a difficult person; while another part of us recognizes the need to self-protect. “Proper distance” allows us to love in a way that honors both desires — it allows us to honor the part of us that loves as Christ loves, even as we take necessary precautions to mitigate harm by limiting, containing, or even ceasing interaction. When we take such steps from a loving place deep inside, we create space for God to work, where we cannot. How do you gain healthy distance from someone whose presence is hurting you? Frequency: Decide how often you want to interact: daily, weekly, monthly, yearly? Decide what level of commitment feels healthy to you and stick to it. Medium: What medium best facilitates the level of communication you desire. For example, can you be alone with this person, or do you always want someone else present? Is it best to stick to written communication (e.g. emails)? Just because someone wants a daily text relationship with you, doesn’t mean you have to comply. You can work to create the frequency and medium that allows the relationship to thrive. Content: What topics are helpful and healthy to discuss? Is this a relationship that is primarily about work, or is it one in which you desire personal topics to be discussed? Do you want this person to know intimate details of your life? If not, stick to general topics that are safe. Decide how much information you want this person to have about you, and how much of their personal information you want to steward. For example, I have a client who decided to stop talking by telephone with her mom. The calls were laced with subtle manipulation and insidious abuse that had gone on for decades. They left her feeling guilt, shame, and anger – emotions that then came out on her own kids. My client knew the dynamics were likely not going to change. Wanting to have some connection to her mom, she started writing her mom short letters each month instead. She shared brief updates about her kids and general information about work, weather, and national events. This proactive strategy allowed my client to honor her mom and yet protect her, and her own children, from being harmed. How do you know when to you might need more distance from someone – even someone that you love? When I interact with this person, am I constantly fighting feelings of anger, guilt or shame? Can I talk about my concerns with this person? Or would it be unsafe? Is this relationship – though sometimes difficult – helping me become more like Christ? If so, then you should start noticing fruit in your life as a result of working through the challenges. Do I want more from this person than they are capable of giving? If you notice a relationship that repeatedly brings out the worst in you, ask yourself if there’s an opportunity for growth and change. If not, what keeps you from taking a step away? Remember, prayer knows no boundaries. Even if you need to establish more distance in a relationship, you can always pray.